At long last, legendary DJ Afrika Bambaataa will finally speak and perform in Grand Rapids this evening. Bambaataa, who had to postpone his previously scheduled January 27 appearances due to illness. After a long wait for local fans, legendary DJ Afrika Bambaataa will finally speak and perform in Grand Rapids this evening. 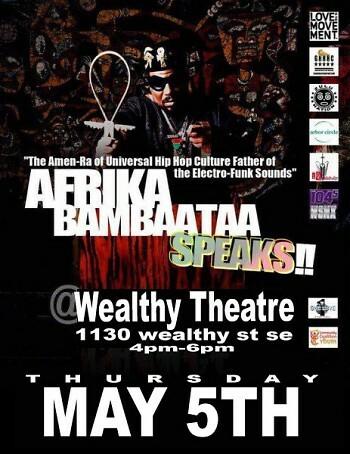 Bambaataa, who had to postpone his previously scheduled January 27 appearances due to illness, will speak this afternoon at 4 p.m. at Wealthy Theatre, and perform at the newly opened Pyramid Scheme tonight at 8 p.m.
Bambaataa’s lecture at Wealthy Theatre, titled “Afrika Bambaataa Speaks,” has been described by event organizer Victor “Governor Slugwell” Willams of the Grand Rapids Hip Hop Coalition as a conversation targeting at-risk youth. "At a time when rap music has become associated with gang violence and drug use in the minds of its critics,” Willams said, “Afrika Bambaataa's voice and history remind audiences that hip-hop culture started as an effort to pull vulnerable inner-city youths away from the dangers of gang membership." Bambaataa’s lecture is a fundraiser for The Love Movement’s “I Am Hip-Hop” project, a program spearheaded by Williams that aims to teach youth the importance of hip-hop culture, the relevance it has in daily life and how it can be used as a tool to overcome negative circumstances. “There is a lot of education that needs to take place here in West Michigan,” explained Williams, “There are a lot of misconceptions about what hip-hop is all about and where it's coming from." 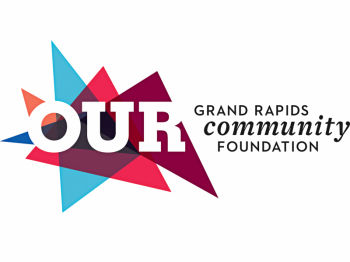 The talk will be followed by a special performance at The Pyramid Scheme, featuring Bambaataa alongside several Michigan-based DJs, hip-hop artists and the 61Syx Teknique breakdance crew. 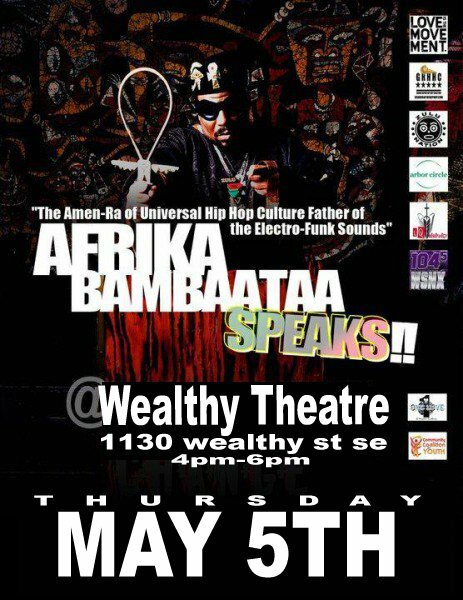 Bambaataa’s lecture at Wealthy Theatre is free for students under the age of 18 and $5 for the general public. Attendance at The Pyramid Scheme performance is restricted to those 18+, and carries a $12.50 cover charge. Tickets for both events are available at the door. This is Bambaataa's first appearance in Grand Rapids. Learn more about the talk on Wealthy Theatre's website and more about the concert on Facebook.